Events | Be The Change U.S.A. Please join Be The Change and Joe Salazar on April 27 to hear about his campaign for Attorney General and support his campaign. We are supporting Joe Salazar because he shares our values when it comes to the economy, health and safety of the residents of Colorado and the protection of the environment of our beautiful state. Help us get him elected as the next Attorney General of Colorado! Where: Home of Phil Doe – 7140 S Depew, in Littleton. See you Friday, April 27! This entry was posted in Events, News, Regional News on April 18, 2018 by Brad Thacker. Denver, CO – The Colorado Attorney General has threatened the attorney who filed the first federal rights of nature lawsuit with sanctions if he does not voluntarily withdraw the Complaint. Rights of Nature activists will gather at dusk (4:30 pm) on Friday, December 1st, outside the Alfred A. Arraj Federal Courthouse, 901 19th St, Denver, CO 80294 in a display of creative resistance. They will demand that the Colorado River have her day in court, condemn the Attorney General’s intimidatory tactics, and call for the American legal system to grant the Colorado River Ecosystem the same rights as corporations. Attorney Jason Flores-Williams, in a letter he sent to the Colorado Attorney General’s office Tuesday morning, November 27th, stated, “The Attorney General’s threat of sanctions is a legally baseless attempt to harass and intimidate a civil rights attorney in good standing who has dedicated his career to protecting the powerless from the powerful.” A copy of the letter is attached. This entry was posted in Events, News, Regional News on November 29, 2017 by Brad Thacker. Be The Change’s Environmental Director Phil Doe will debate the pros and cons of fracking this Thursday at the Denver Post Auditorium. Phil will be joined by Hunter Lovins, President of Natural Capital Solutions. Arguing in favor of fracking are John Harpole, President, Mercator Energy, and Kathleen Sgamma, Vice President at Western Energy Alliance. The debate will be moderated by Eric Sondermann. Tickets are free, but space is limited and you must have a ticket to enter the auditorium. Tickets can be reserved at https://justthefrackingfacts.eventbrite.com. A maximum of 5 tickets are allowed per order. This entry was posted in Events, Regional News on March 18, 2014 by admin. Please Support HB 13—1275 A Report on the Health Impacts of Oil and Gas Operations Near the Front Range. This bill would require Colorado Department of Public Health and Environment to commission a study of epidemiological data to identify possible health impacts related to oil and gas activity. This bill will be heard on Thursday, ~10:00 am, April 11, 2011 at the State Capitol, 200 E. Colfax, Denver, CO. This entry was posted in Events, Fracking, News, Regional News on April 8, 2013 by admin. Join ArgusFest along with local and national media reform activists, authors, and journalists at the Denver Welcome party for the National Conference for Media Reform. Thursday, April 4, Argusfest will host the U.S. 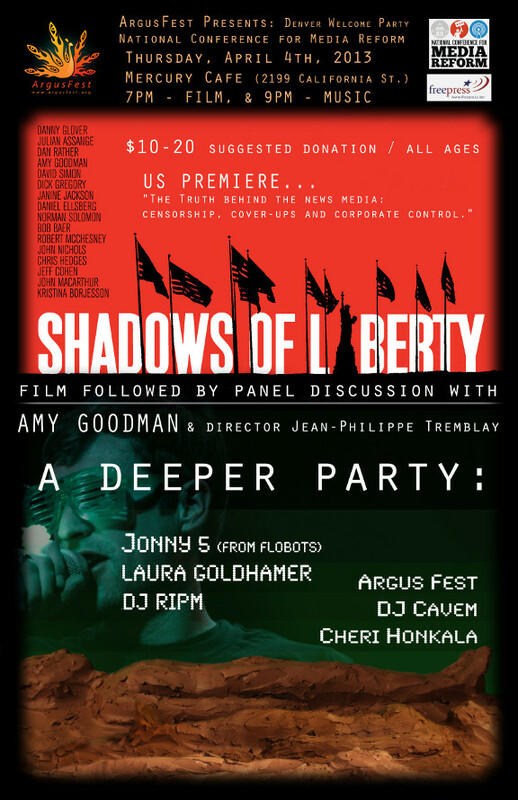 Premiere of the documentary Shadows of Liberty, which looks at how the corporate media misleads the American people. The film will be followed by a discussion with Amy Goodman and Jean-Philippe Tremblay. Then at 9 PM we will have live music featuring Jonny 5 (from the Flobots), Laura Goldhamer, DJ RIPM, and DJ Cavem. National anti-poverty organizer and the 2012 Green Party Vice-Presidential nominee Cheri Honkala will also be joining us to say a few words about the state of our media. It’s going to be a great night with a lot of great people. This entry was posted in Events, News, Regional News on April 2, 2013 by admin. The Senate Health and Human Services Committee (HHS) will hear SCR13-002 “Colorado Health Care Cooperative,” which would send the Cooperative to the voters for approval as a Constitutional Amendment in Nov. 2013. This entry was posted in Events, Health Care, Regional News on March 31, 2013 by admin. Thursday, March 28, at 10:30 AM. that will make a difference! This entry was posted in Events, Fracking, News, Regional News on March 26, 2013 by admin.